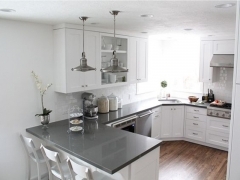 Quartz has great hardness and qualities so that other products can't compared with it. 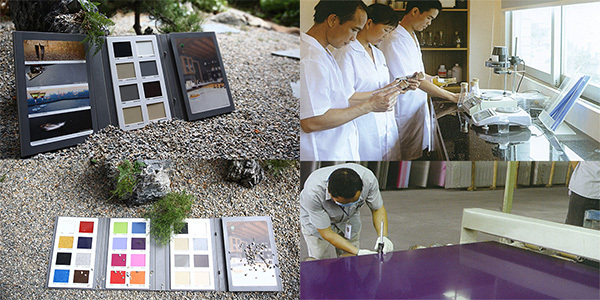 It's also an ideal for commercial use, adding color and sophistication to restaurants, offices, building exteriors, public restrooms and more. 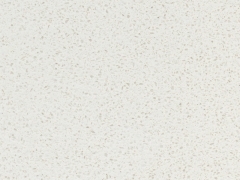 Maria White Quartz Stone Tops PS3845 INTRODUCTION Quartz has non-porous surface and unique beauty cause its convenient to care and fit for modern lifestyle. Finding your favorite color and size to designing at once! INFORMATION 1. 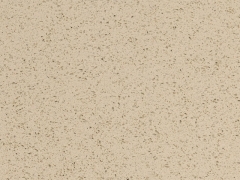 Specification Color - Brown Material - Quartz Finished way - Polished; Honed; etc. Edges - Full Bullnose, Half Bullnose, Flat Eased(eased edge), Bevel Top, Radius Tops, Laminated, Ogee Edge, Beveled Processed 2. Available Size Countertop Round Table - 36"; 42"; 48"; 60" Countertop Island - 36"×72"; 36"×108" Countertop Snack Bar - 12"×78"; 16"×78"; 18"×96" Island (snack bar) Common sizes for vanity tops - 25"×19"/22"; 31"×19"/22"; 37"×19"/22"; 49"×19"/22"; 61"×19"/22"(single or double sinks) Back splash - 4''; 6'' height Side splash - 4''; 6'' height Thickness - 3/4''; 1 1/4"Kitchen Countertop - 25.5"×96"; 26"×96"; 26"×108" Available size and edges design will according to your requirement. 3. Packing Outside with seaworthy strong wooden crate; Inside with soft plastic foam. 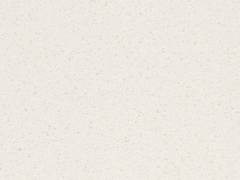 READ MORE You can click here to view COUNTERTOPS & COLLECTIONS If you want to know more our information, also can click here to watch ABOUT US/CUSTOMER SERVICE/CONTACT US OUR ADVANTAGE - As one of the most reliable stone manufacturer in Shuitou, Quanzhou city. We specializes in the research, production and export of marble/granite, counter top, vanity top etc. - With years production experience and own team of designer & CAD people, all price will be offered within 12 hours. - Our services aim:(4F) Customer first, Quality First, Service First, Reputation First. - Quality ensured: All products are inspected piece by piece by experienced QC before Package. - Small samples are free available, Welcome to visit our factory and company. Kensho Grey Quartz Counter Tops PS3087 INTRODUCTION Quartz has non-porous surface and unique beauty cause its convenient to care and fit for modern lifestyle. Finding your favorite color and size to designing at once! INFORMATION 1. Specification Color - Brown Material - Quartz Finished way - Polished; Honed; etc. Edges - Full Bullnose, Half Bullnose, Flat Eased(eased edge), Bevel Top, Radius Tops, Laminated, Ogee Edge, Beveled Processed 2. Available Size Countertop Round Table - 36"; 42"; 48"; 60" Countertop Island - 36"×72"; 36"×108" Countertop Snack Bar - 12"×78"; 16"×78"; 18"×96" Island (snack bar) Common sizes for vanity tops - 25"×19"/22"; 31"×19"/22"; 37"×19"/22"; 49"×19"/22"; 61"×19"/22"(single or double sinks) Back splash - 4''; 6'' height Side splash - 4''; 6'' height Thickness - 3/4''; 1 1/4"Kitchen Countertop - 25.5"×96"; 26"×96"; 26"×108" Available size and edges design will according to your requirement. 3. Packing Outside with seaworthy strong wooden crate; Inside with soft plastic foam READ MORE You can click here to view COUNTERTOPS & COLLECTIONS If you want to know more our information, also can click here to watch ABOUT US/CUSTOMER SERVICE/CONTACT US OUR ADVANTAGE - As one of the most reliable stone manufacturer in Shuitou, Quanzhou city. We specializes in the research, production and export of marble/granite, counter top, vanity top etc. - With years production experience and own team of designer & CAD people, all price will be offered within 12 hours. - Our services aim:(4F) Customer first, Quality First, Service First, Reputation First. - Quality ensured: All products are inspected piece by piece by experienced QC before Package. - Small samples are free available, Welcome to visit our factory and company. Colored Glaze Gold Quartz Stone PS3300 For Sale INTRODUCTION Quartz has non-porous surface and unique beauty cause its convenient to care and fit for modern lifestyle. Finding your favorite color and size to designing at once! INFORMATION 1. 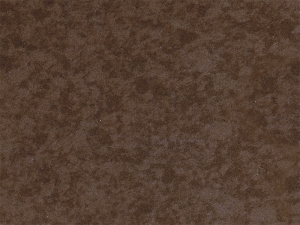 Specification Color - Brown Material - Quartz Finished way - Polished; Honed; etc. Edges - Full Bullnose, Half Bullnose, Flat Eased(eased edge), Bevel Top, Radius Tops, Laminated, Ogee Edge, Beveled Processed 2. Available Size Countertop Round Table - 36"; 42"; 48"; 60" Countertop Island - 36"×72"; 36"×108" Countertop Snack Bar - 12"×78"; 16"×78"; 18"×96" Island (snack bar) Common sizes for vanity tops - 25"×19"/22"; 31"×19"/22"; 37"×19"/22"; 49"×19"/22"; 61"×19"/22"(single or double sinks) Back splash - 4''; 6'' height Side splash - 4''; 6'' height Thickness - 3/4''; 1 1/4"Kitchen Countertop - 25.5"×96"; 26"×96"; 26"×108" Available size and edges design will according to your requirement. 3. Packing Outside with seaworthy strong wooden crate; Inside with soft plastic foam. READ MORE You can click here to view COUNTERTOPS & COLLECTIONS If you want to know more our information, also can click here to watch ABOUT US/CUSTOMER SERVICE/CONTACT US OUR ADVANTAGE - As one of the most reliable stone manufacturer in Shuitou, Quanzhou city. We specializes in the research, production and export of marble/granite, counter top, vanity top etc. - With years production experience and own team of designer & CAD people, all price will be offered within 12 hours. - Our services aim:(4F) Customer first, Quality First, Service First, Reputation First. - Quality ensured: All products are inspected piece by piece by experienced QC before Package. - Small samples are free available, Welcome to visit our factory and company. 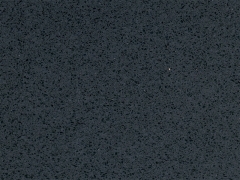 Jazz White Quartz Stone For Countertops PS3871 INTRODUCTION Quartz has non-porous surface and unique beauty cause its convenient to care and fit for modern lifestyle. Finding your favorite color and size to designing at once! INFORMATION 1. Specification Color - Brown Material - Quartz Finished way - Polished; Honed; etc. Edges - Full Bullnose, Half Bullnose, Flat Eased(eased edge), Bevel Top, Radius Tops, Laminated, Ogee Edge, Beveled Processed 2. Available Size Countertop Round Table - 36"; 42"; 48"; 60" Countertop Island - 36"×72"; 36"×108" Countertop Snack Bar - 12"×78"; 16"×78"; 18"×96" Island (snack bar) Common sizes for vanity tops - 25"×19"/22"; 31"×19"/22"; 37"×19"/22"; 49"×19"/22"; 61"×19"/22"(single or double sinks) Back splash - 4''; 6'' height Side splash - 4''; 6'' height Thickness - 3/4''; 1 1/4"Kitchen Countertop - 25.5"×96"; 26"×96"; 26"×108" Available size and edges design will according to your requirement. 3. Packing Outside with seaworthy strong wooden crate; Inside with soft plastic foam. 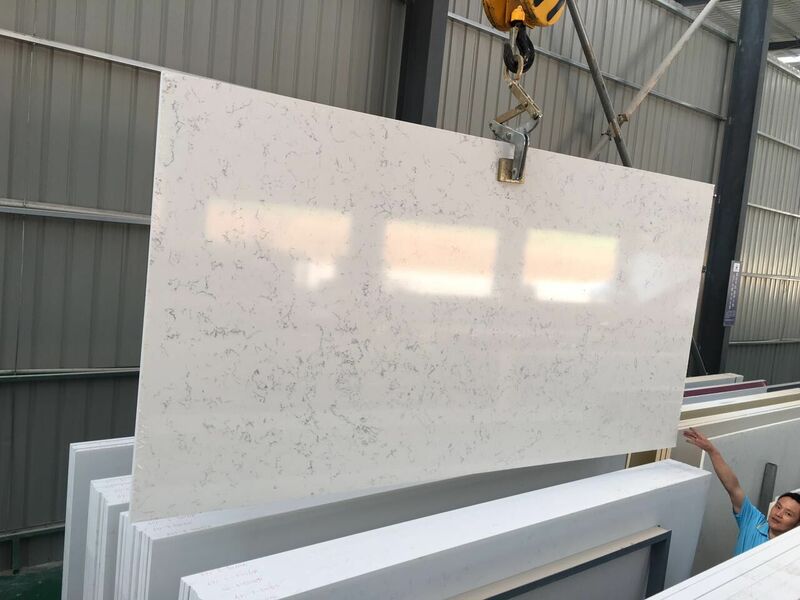 READ MORE You can click here to view COUNTERTOPS & COLLECTIONS If you want to know more our information, also can click here to watch ABOUT US/CUSTOMER SERVICE/CONTACT US OUR ADVANTAGE - As one of the most reliable stone manufacturer in Shuitou, Quanzhou city. We specializes in the research, production and export of marble/granite, counter top, vanity top etc. - With years production experience and own team of designer & CAD people, all price will be offered within 12 hours. - Our services aim:(4F) Customer first, Quality First, Service First, Reputation First. - Quality ensured: All products are inspected piece by piece by experienced QC before Package. - Small samples are free available, Welcome to visit our factory and company. Califonia Grey Quartz Stone PS3943 For Sale INTRODUCTION Quartz has non-porous surface and unique beauty cause its convenient to care and fit for modern lifestyle. Finding your favorite color and size to designing at once! INFORMATION 1. 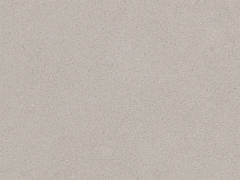 Specification Color - Grey Material - Quartz Finished way - Polished; Honed; etc. Edges - Full Bullnose, Half Bullnose, Flat Eased(eased edge), Bevel Top, Radius Tops, Laminated, Ogee Edge, Beveled Processed 2. Available Size Countertop Round Table - 36"; 42"; 48"; 60" Countertop Island - 36"×72"; 36"×108" Countertop Snack Bar - 12"×78"; 16"×78"; 18"×96" Island (snack bar) Common sizes for vanity tops - 25"×19"/22"; 31"×19"/22"; 37"×19"/22"; 49"×19"/22"; 61"×19"/22"(single or double sinks) Back splash - 4''; 6'' height Side splash - 4''; 6'' height Thickness - 3/4''; 1 1/4"Kitchen Countertop - 25.5"×96"; 26"×96"; 26"×108" Available size and edges design will according to your requirement. 3. Packing Outside with seaworthy strong wooden crate; Inside with soft plastic foam. 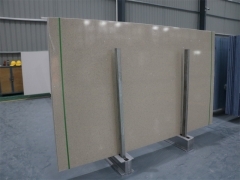 READ MORE You can click here to view COUNTERTOPS & COLLECTIONS If you want to know more our information, also can click here to watch ABOUT US/CUSTOMER SERVICE/CONTACT US OUR ADVANTAGE - As one of the most reliable stone manufacturer in Shuitou, Quanzhou city. We specializes in the research, production and export of marble/granite, counter top, vanity top etc. - With years production experience and own team of designer & CAD people, all price will be offered within 12 hours. - Our services aim:(4F) Customer first, Quality First, Service First, Reputation First. - Quality ensured: All products are inspected piece by piece by experienced QC before Package. - Small samples are free available, Welcome to visit our factory and company. 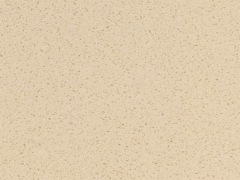 Baili Yellow Colors Quartz PS3960 INTRODUCTION Quartz has great hardness and qualities. Baili Yellow Colors Quartz PS3960 is made by top quality material,and with beautiful color and design for decoration. 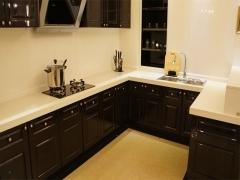 Our factory will available customized size and design for quartz counter tops. We also provide edges and finished way choices to make you satisfied with it. INFORMATION 1. Specification Color - Yellow Material - Quartz Finished way - Polished; Honed; etc. Edges - Full Bullnose, Half Bullnose, Flat Eased(eased edge), Bevel Top, Radius Tops, Laminated, Ogee Edge, Beveled Processed 2. Available Size Countertop Round Table - 36"; 42"; 48"; 60" Countertop Island - 36"×72"; 36"×108" Countertop Snack Bar - 12"×78"; 16"×78"; 18"×96" Island (snack bar) Common sizes for vanity tops - 25"×19"/22"; 31"×19"/22"; 37"×19"/22"; 49"×19"/22"; 61"×19"/22"(single or double sinks) Back splash - 4''; 6'' height Side splash - 4''; 6'' height Thickness - 3/4''; 1 1/4"Kitchen Countertop - 25.5"×96"; 26"×96"; 26"×108" Available size and edges design will according to your requirement. 3. Packing Outside with seaworthy strong wooden crate; Inside with soft plastic foam. 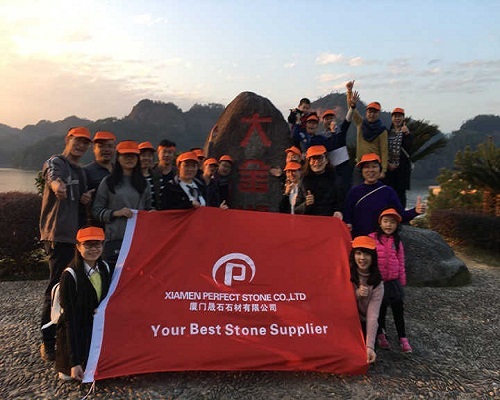 READ MORE You can click here to view COUNTERTOPS & COLLECTIONS If you want to know more our information, also can click here to watch ABOUT US/CUSTOMER SERVICE/CONTACT US OUR ADVANTAGE - As one of the most reliable stone manufacturer in Shuitou, Quanzhou city. We specializes in the research, production and export of marble/granite, counter top, vanity top etc. - With years production experience and own team of designer & CAD people, all price will be offered within 12 hours. - Our services aim:(4F) Customer first, Quality First, Service First, Reputation First. - Quality ensured: All products are inspected piece by piece by experienced QC before Package. - Small samples are free available, Welcome to visit our factory and company.